View of the Great Court, the focal point of Trinity College, Cambridge. 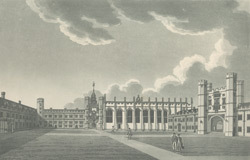 It was built on the orders of Thomas Nevile, who had been appointed Master of the College in 1593. The College, which had been founded by Henry VIII in 1543, was previously a mixture of the old buildings of Michaelhouse and King's Hall. It lacked a sense of identity and coherence. Using the ranges of pre-existing buildings, a large courtyard was established which was the largest at the university. This picture shows the Gothic Chapel, the Master's Lodge, the great gate entrance and the entrance known as King Edward's Tower (the clock tower).